Many are the stories that were told in the Hebrew Bible, but the one story that is yet to be told is the story of the Hebrew Bible itself. The relationship with gods/god has always been one of man’s oldest preoccupations, and still is till this very day. While it’s fair to assume that Modern day man owes his advancement in philosophy and science to ancient Greece and its earliest thinkers, it’s equally fair when it comes to the development of religion and the evolution of religious thinking to give credence to the ancient civilizations of Egypt and Mesopotamia. In fact, the earliest vestiges of human faith in God, as we know it today, are to be traced back to the valley of the River Nile and the one between the rivers Euphrates and Tigris. 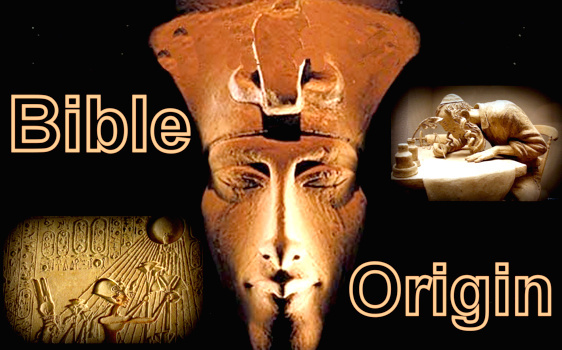 We’re surely to find the root of our belief in a supreme creator inscribed, in hieroglyphs and cuneiform, on the pyramids and papyri of ancient Egypt and on the clay tablets of Sumer … And not within the confines of the Hebrew Bible, as many still believe. If we still cherish the Greek school of wisdom and science and continue to build on the teachings of Socrates, Plato, Aristotle and Pythagoras, I wonder why we stopped honoring the ancient gods of Egypt and Sumer and Babylon. What has become of the mighty gods of the ancient Near East? What happened to Anu and Enlil, what has become of the beautiful Goddess “Inanna” Ishtar … The one god, Aten, and what happened to the omnipotent Amun/Amen of Thebes? … Amen, whose name is still echoing in every house of prayers on earth? 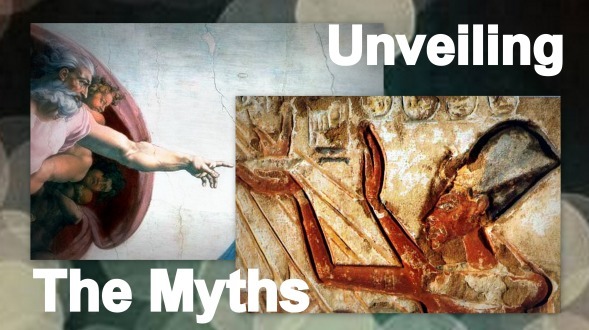 How come we fail to recall any of the magnificent epics of Sumer (watch video of the epic of Gilgamesh) or the amazing mythology of Egypt (watch video of the Egyptian creation myth) whereas our kids know the stories of the Hebrew Bible by heart? But then again, if our kids are to be introduced to the myths of ancient Egypt and the epics of Sumer (watch video of the Sumerian creation myth) they won’t feel like they are in a strange land. The stories of Sumer and Egypt will sound so familiar. … This has long been common knowledge amongst the scholars of history, archeology and anthropology, but I find it extremely necessary today, in the so called information age, to drag it out of the academic realm and expose it in the open before the public eyes. But then, what do we, men of modern times, know or even care? … We were only told that in the beginning was the word. But according to history … it wasn’t. In the beginning, was the river – the Nile in Egypt and Tigris and Euphrates in Mesopotamia. The river and its fertile delta granted the Egyptians and the Sumerians not only the stability and prosperity but also the time to contemplate life and beyond. This is how ancient mythology and spirituality kicked off and evolved. Unlike the desert culture of violent conflict and raids, cultivating the land required communal work that had to follow social norms and values based on collaboration. This was the dawn of social conscience. Man’s first moral code of conduct was not handed down to him on some clay tablet; rather it was an outcome of his early social experiences that were based on cooperation and not on aggression. 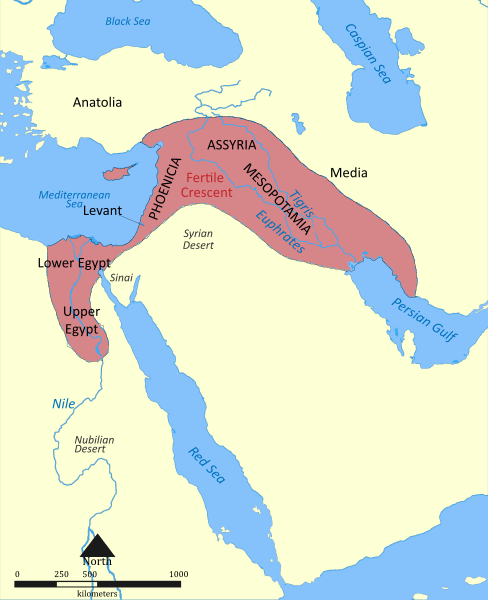 The Egyptian/Mesopotamian communities of farmers were highly influenced by the dynamics of the river. The ebb and flow of their rivers made the Egyptian and Mesopotamian farmers think of life as a (repeated) cycle of birth, decay and rebirth again. This was man’s first vestiges of religious thinking. But does that mean that non-agricultural communities were not religious? To answer that question, we first have to differentiate between religion and rituals. Most primitive communities, e.g., nomadic tribes like the Hebrews, had their local deities, as gods of war and fertility. On the other hand, a religion in ancient Egypt was not a religion of comfort or beneficence. It was an all-embracing doctrine, like a harmony that was observed by all the players in a big philharmonic orchestra. It was a way of life. These Egyptian and Mesopotamian religions were Mythopoeic. Whereas our world view may be scientific or rational, so we tend to believe, these river civilizations adopted a world view based on myth. Now we know that religion, with colossal temples and ziggurats and creation myths, first sprouted along the fertile banks of the Tigris and Euphrates in Mesopotamia and the river Nile in Egypt. Then how could we explain the dominance of Judaism, some tribal cult which supposedly originated (centuries later in time) amid the arid terrains of ancient Arabia, over the Egyptian and Sumerian once thriving theologies? Actually Judaism didn’t, surpass the influence of the Egyptian nor the Sumerian theology; this was a formidably hard task for any nomadic community to aspire for, instead Judaism did it the easy way. As the antiquity era was approaching an end, and as the hieroglyphic and the cuneiform writings were getting extinct, the Hebrews simply stole the Egyptian and the Sumerian thunder. The Hebrew scribes, whom I presume knew what they were doing, copycatted the famous myths/epics of ancient Egypt and Sumer, in what could be the world’s first and yet the biggest copyright infringement, and stuffed their Bible with them. The Hebrews as nomadic tribes, and later as tradesmen, were always on the move all over the west coast of ancient Arabia (ancient Incense route) that was bounded to the west by Egypt and to the east by Sumer and Babylon (Mesopotamia). Their constant journeys gave them access to the famous epics and stories/myths of the ancient Near East. While geography was the reason behind the development of the brilliant civilizations of both the Egyptians and the Sumerians, it was on the other side, and ironically enough, the main cause for the Hebrews’ misfortune. Delivered to the savagery of the clans and Squeezed in a land barren and hostile between the ancient superpowers without any chance of military resistance or evolving further beyond the nomadic/unsettled structure, the Jews turned to metaphysics and began to fantasize. In an atmosphere of despair and rage, especially after the Romans ruthlessly crushed what was seen as the last Hebrew disobedience (66-70 CE) the Jewish religious megalomaniac Messianic fantasies prospered. The powerlessness of the Jews found an outlet in the myths and invented a glorious national history- something similar to what modern day Zionism did – avenging long years of ostracism and cruelty and dragging their enemy’s names through the dirt. It was only after the Babylonian Captivity that the Rabbis had thought of writing down their oral teachings. Contrary to the Israelite gloomy depiction of the Captivity, this deportation had been an enlightening experience for the ancient Israelites. Those herds of Israelite Bedouins/nomads for the first time had a rare encounter with a superior urban civilization. The Babylonians were settled urban communities with a unique culture, .e.g., art, architecture, theology and mythology. This is when the Hebrew scribes, by default or by design, had incorporated many of the ancient Sumerian and Assyrian mythology and blended them into their new book. In the Bible, the Hebrew scribes unleashed the dagger of malevolence and took a stab at the superpowers of the ancient world, namely Egypt, Sumer and Babylon. Through a prism of total prejudice and deeply seated grudge the Hebrew scribes wrote, page up and page down, not what really happened in ancient times, but rather what they wished had happened. So, in their scrolls, the Hebrew scribes depicted Babel (Babylon) as the (hot bed of vice) with its tower in ruin, where in reality it stood 90 meters high, and Egypt as the land of slavery and tyranny, devastated by Yahweh’s gruesome plagues in the aftermath of which Egypt’s Pharaoh and his army drowned, where in fact, Egypt stood, for uninterrupted 3000 years, as one of the ancient world’s superpowers. At that time, something quite weird, that only analytical psychology could explain, started taking place in the Hebrew Bible. Everything the Israelites desperately longed for (namely a mythology with fascinating stories like that of the Sumerians, a religion with big temples like that of the Egyptians … and yes, a piece of land they could call home like everybody else) the Hebrew scribes made damn sure it was granted to them on the pages of their bible. And in the process of making up a virtual/counterfactual history for the Israelites, the bible scribes had to simply rewrite the ancient Near Eastern history in a way that would make room for their tribal patriarchs to fit into its history. Replacing Ziusudra with Noah, Enki with Adam, Sargon of Akkad with Moses, Aten with Yahweh and most importantly Faraon with the King of Egypt, the Hebrew scribes gave the world one of its most inconsistent and dangerous books ever. In a cunning way, the Hebrew scribes, as they wrote down the scripture of their Bible, had plagiarized the ancient Near Eastern wisdom and claimed it theirs. Copying the ancient and profound Egyptian/Mesopotamian mythology by a bunch of mysterious Hebrew scribes was, from my perspective, the beginning of the deterioration of human religious thinking. Unlike the Greek mythology, the ancient Near Eastern mythology was denied, by the demise of the ancient languages and the Hebrew alteration/defacement of its stories the golden opportunity of producing/fostering a European-like renaissance. The Hebrews, appropriating what otherwise could have stayed as one of the world’s finest myths and theology, have turned it into a completely different thing. They have molded it into a tribal thing; the universal nature of the Egyptian gods, e.g., Amun, Aten, had been twisted and refashioned to function only as the Hebrews’ own exclusive god, and hence the Hebrews as his own chosen people. And in a way this dominating concept of favoritism/nepotism has, and for the first time in the history of mankind, introduced/nurtured the idea of religious extremism. Usurping the profound mythology of the ancient Near East by the Israelites, was like snatching the original score of Franz Schubert’s last and unfinished symphony and handing it over to some tribal drum player to finish the job. Need we ponder over the product of such undertaking? … Nothing short of a total catastrophe. Some will argue that the echoing of the Sumerian and Egyptian myths and beliefs in the Hebrew Bible is but another example of interaction/influence amongst the different cultures of the ancient Near East. “The literature created by the Sumerians left its deep impress on the Hebrews. To be sure, the Sumerians could not have influenced the Hebrews directly, for they had ceased to exist long before the Hebrew people came into existence. But there is little doubt that the Sumerians had deeply influenced the Canaanites, who preceded the Hebrews in the land that later came to be known as Palestine” pp.143-4, “History Begins at Sumer” Samuel Noah Kramer. Secondly, of course the Hebrews/Israelites were influenced by the Mesopotamian literature and the Egyptian Theology, but frankly, the Hebrew case was more than just another cultural interaction; it was an act of infringement. And even if by time, the Sumerian and Egyptian myths had probably turned into anecdotal tales of the distant past, how could we explain the reason/motive why the names of the main characters were extracted out and replaced by Hebrew counterfeits. … Moreover, with all the previous overlooked, how could we forgive the Hebrews’ wickedness of ascribing all this wisdom to their tribal god? As their scribes were tampering with the history and the mythology of the ancient Near East, and through their ignorance/deceit the Israelites messed up not only with the great stories of Egypt and Sumer but they also damaged the concept of universalism and pluralism that for centuries characterized the religious thinking of the ancient Near East. As the Hebrew scribes were tramping over the history of the ancient Near East they rewrote/invented a mythical table of nations (sons of Noah) that, at the end, and through a long cycle of selective favoritism, came down and as expected to favoring the sons of Shem (founding myth of modern day Semitism). And hence, the world through the tribal lens of the Israelites was only conceivable as Jews vs. Gentiles. This lingering duality complex that denied the Jews, till this very day, the ability to assimilate anywhere outside the psychological orbit of the tribe. 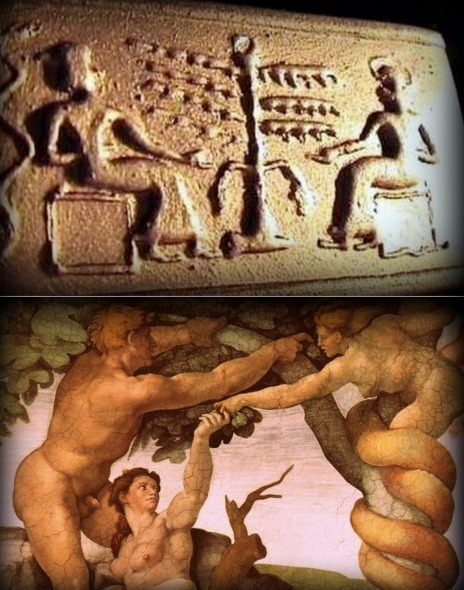 Contrary to what many may believe the Hebrew bible did invent/create the idea of monotheism, the Egyptian king Akhenaten did that and centuries before Judaism, and as a matter of fact YHWH, the Israelites’ one god had a consort by the name ‘Asherah’ On the other hand, the Sumerian and Egyptian pantheon of gods were pyramidal/hierarchical in a way that was feeding into the concept of one and supreme god presiding over the pantheon – aka Henotheism. 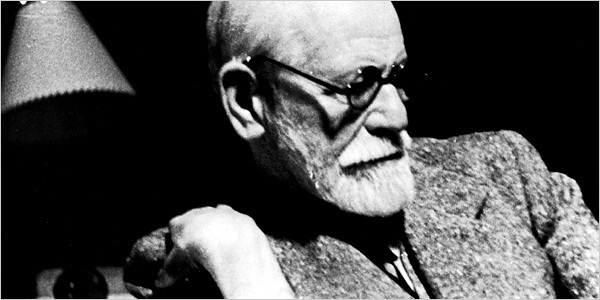 In his famous book, Moses and monotheism, Sigmund Freud concluded that monotheism was not a Jewish but an Egyptian invention, descending from the cult of the Egyptian sun god Aten. Moreover, upon applying his psychoanalysis to the myths/stories of the Hebrew bible, Freud not only argued that Moses was an Egyptian priest but he was also perplexed by how the whole story of Moses/Exodus, according to the oedipal pattern of analysis, was inverted and didn’t make sense the way it had been told. In other words the Hebrew myths/stories didn’t seem original. Had Freud lived longer, delved deeper into the mythology of the ancient Near East, he would have reached the same startling conclusion about the origin of the Hebrew bible stories, as he did monotheism. What Judaism actually added to the world’s religious thinking is something totally different and, at the same time, inherently harmful. Through their tribal and somehow shallow collective mentality, the Hebrews had planted the root of religious dogmatism and fanaticism when they allowed for the absurd idea of God’s chosen people to flourish and permeate the religious thinking from then on. Unfortunately that religious extremism passed on to Christianity, which was supposed to act as a counterbalance to Judaism’s tribal vulgarity, until it reached its worst case in Islam. What good is this kind of monotheism when its adherents, be it Jews, Christians or Muslims, are soaked to the skin in their fundamental belief/illusion that their god is the only true god and hence they are the true sons/believers … and that the others are just deluded people who somehow got lost along the way to salvation. Dividing the world into Jews and Goyim is simply the Jewish idea of monotheism, or in other words, the Jewish defacement of monotheism which we today and most unfortunately still endure through its long term fallouts. What kind of god, who would favor a particular son and detest/abandon his others. Find out how Judaism played a key role in obstructing the world’s ancient wisdom and knowledge and distorting its history. Compared to the monotheism of Akhenaten and his god Aten, the prejudiced monotheism of Judaism- based mainly on the principle of nepotism/favoritism- was such a dangerous setback for the ancient religious thinking. The Aten, contrary to the tribal version of Yahew, was a universal god, a sun disk that stretched out its rays all over the earth and blessed everybody, not just the Egyptians. The Hebrew scribes, in a cheap bid to grant a piece of land to the Israelites, and by default or design, had stripped the mythology of ancient Sumer and the theology of Egypt of its mysticism, universalism and wisdom.